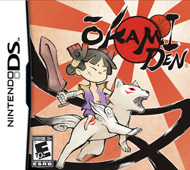 <br>Okamiden is a picturesque action adventure game for the Nintendo DS. Taking place a few months after the events of Okami, Okamiden will follow the adventures of Chibiterasu a young sun god who is summoned to protect the land. Following in the footsteps of its parent Amaterasu, the sun-god-turned-wolf in Okami, Chibiterasu takes the form of an adorable wolf pup for the mission ahead. Chibiterasu will join forces with a rich cast of characters to fight off a new threat that has leeched the world of its vibrant color again. Beyond the battles, Chibiterasu and buddies will come to realize their inner potential and accept the kinship that comes with being the children of great heroes and gods.Using the DS stylus, you will wield a celestial brush controlled by Chibiterasu. This powerful tool can attack enemies, paint helpful objects and structures into existence and help Chibiterasu perform exceptional feats that will change the world before your eyes. Chibiterasu's partners in the game will have unique abilities of their own that help you conquer puzzles and face an onslaught of perilous challenges. By blending vivid myth, artistic action and the innovative Nintendo DS, Okamiden has all the makings of a handheld classic. Okamiden takes the best elements of the Okami series and combines them with invigorating new features delivering an extraordinary adventure sure to please fans of the series and newcomers alike.